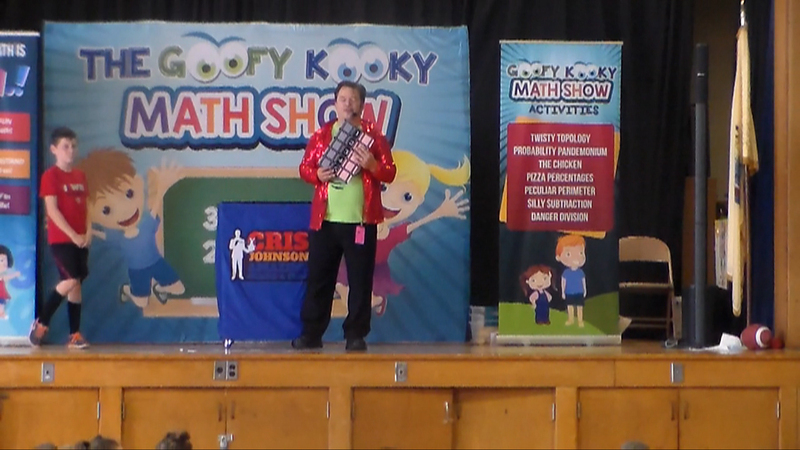 A Math School Assembly That Is Interactive & Fun! Who says math is boring? Unfortunately, a lot of kids! Out of all of the assembly programs that I offer, this was the most difficult one to write. I’ve seen other math assemblies and they are all the same – too much talk and focus on numbers. Kids get enough numbers in class. I made the goals of this assembly threefold: First, teach the students that there is so much MORE to math than just numbers. Then the next goal was to show kids just how much math concepts play a role in their everyday lives – math is all around them! Finally, to really instill the idea that math can be so much FUN! 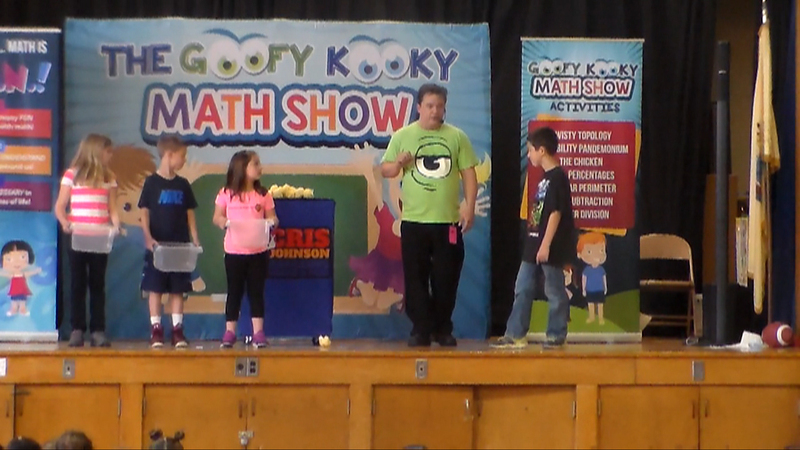 The “Goofy Kooky Math Show” assembly program is filed with games, contests, music, magic, zany humor, audience interaction, and more. It’s got a little of everything in it: There’s a contest between 4 kids involving tangram puzzles, a goofy odds and evens sorting game with stuffed chickens set to “Chariots of Fire,” slices of pizza are used to demonstrate concepts of percentages, three kids discover a topological secret to a stunt with ropes, a 3” x 5” notecard and a student’s head teaches concepts of perimeter and geometry, a ten minute contest between teachers and students, and of course “Danger Division,” which speaks for itself! Those concepts are from the grades K-5 version of the assembly. I also have a version for middle schoolers! In the middle school version of the “Goofy Kooky Math Show” assembly, I have fun lessons on statistics, percentages, probability, and more. Plus, your middle school students will learn some math stunts they can use to create the illusion they can read minds! They will love it, and become more interested in math as a result… guaranteed! The important thing to remember is that this assembly is NOT a dry, boring lecture…and it’s not “just for fun” either. This assembly introduces students to fascinating math concepts, reinforces terms your students hear in class, and demonstrates just how important and fun math is! Your students will participate in fun, goofy math activities, puzzles, and magic tricks with fun, silly activities! Call (716) 940-8963 (that’s my cell number) or fill out the Contact Form above to get “Goofy Kooky Math Show” information sent to you instantly! 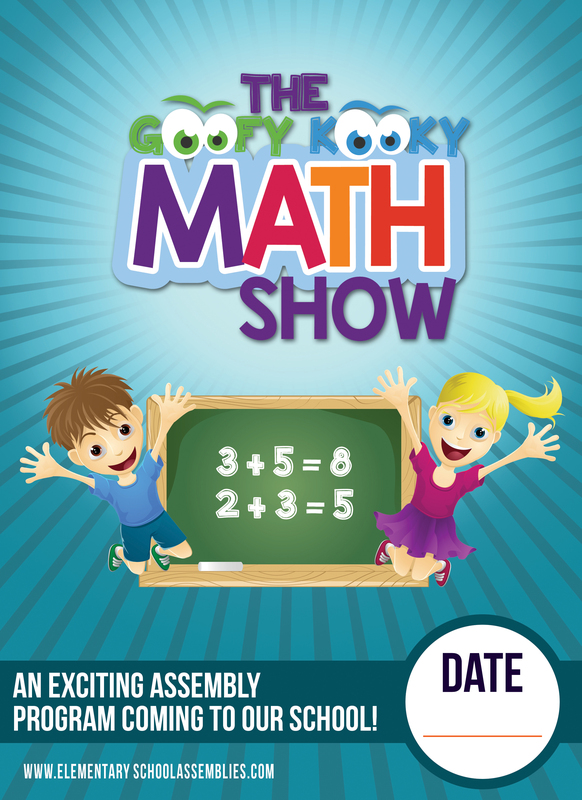 Bring the “Goofy Kooky Math Show” to YOUR school and get YOUR students excited about math and help kids remember…Math is F.U.N!